In 2010, Tacoma Weavers Guild celebrates 75 years of active commitment to promoting handweaving and related fiber arts in the South Puget Sound region with celebrations through the months of November and December. 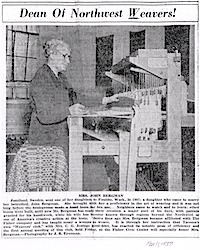 Inspired by Swedish immigrant, weaver and loom maker Margaret Bergman, 22 women met for the first time December 7, 1935 at the Fischer Store in downtown Tacoma. At that time, they were the only handweaving guild in Washington State. Now there are 24 active Guilds. As the longest-running organization of its kind (in the Pacific Northwest), TWG has provided 75 years of continuous educational opportunities for its members and enriched the city’s arts and cultural landscape through its creative work in the textile arts.